Massage soap with the bumps and nubs on one side is lovely stuff. But what happens when you use soap? Within a few showers, those bumps are gone. What to do? Make the Pampering Massage Soap Saver! 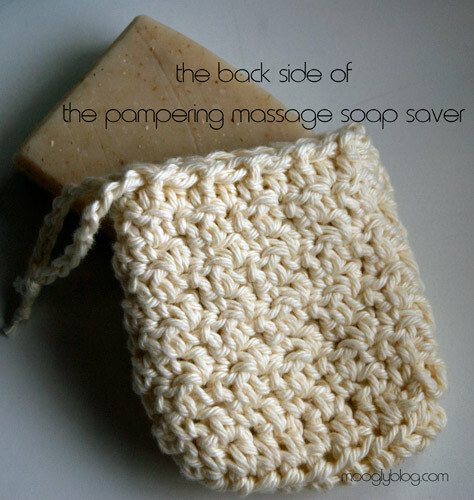 This crochet soap saver pattern features 12 bumps (aka cluster stitches) on one side for perfect pampering that doesn’t wear away. Paired with a gorgeous soap it makes a great gift for teachers, neighbors, babysitters – and don’t forget one for yourself! The soap sack is a quick project – each one done in an hour or less – but don’t let the soap itself be an afterthought. Bean Tree Soap is where I get all my precious lovely soaps for gift giving (and a few for myself)! It’s handcrafted artisan soap, as well as lotion bars, lip balms, and more. There are gift sets, custom scents, even soap on a rope that smells like dirt for the hunters on your gift list! It really is gorgeous, gorgeous stuff, I can’t say enough good things about the products. Prefer to buy rather than make? 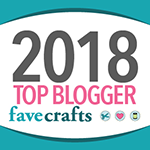 There are Moogly made soap sacks available at Bean Tree Soap, or you can head to the Moogly Makers page to order from one of the talented crocheters listed there! 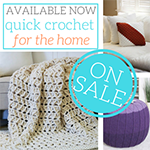 Now on to the free crochet pattern! Prefer a non-bumpy version? Replace Round 4 and it’s repeats with Round 5 instructions each time. For video tutorials on the stitches used in this pattern, please go to the Video Tutorials page, including the Cluster (Puff) Stitch! CL – Cluster Stitch (Puff Stitch): [Yo, insert hook into next st, pull up a loop to height of row] 4 times, working into the same st each time, until there are 9 loops on the hook. Yo and pull through 8 loops, yo and pull through last two loops on hook. Round 6 – 11: Repeat Rounds 4 – 5 three times. Round 12: Ch 1, hdc in each st around. Break yarn and use seamless join, joining to the second stitch of the round. Weave in ends. Make Drawstring: Chain tightly for 12 inches. Weave through top of Round 12, tie knots in ends and trim strings. Now go visit Bean Tree Soap and get something to fill it with! It’s great stuff! Be sure to Like the moogly Facebook page for the latest updates and have some fun with us! Written pattern copyright Tamara Kelly 2012. Please do not reprint or repost this pattern, but please feel free to link to this page to share this pattern with others. Reseller info is on the About page. Your Ravelry link is not working as of now. Great design! well, I made it. But it took me a while to realize that I was supposed to turn in the traditional “baby blanket” way. I turned the pouch and changed directions, but did not end up with a seam. You should try that — it saves the seam sewing. I also made mine another 2 rows longer because my husband (the receiver of this gift) used a longer bar of soap. Thanks for the pattern. Anyhow — thanks! And the soap – wonderful. I got a super quick reply from them and will be ordering to fill up my scrubby pockets. ok — anyway, don’t mind me and my ramblings — I just watched your video for “seamless stitch” and though I am happy to have learned something new, I am feeling kind of like an . . well, the last two posts don’t make me look like someone who reads directions, do they? Heh, no worries! I understand. I should probably have been more clear about turning the bag “wrong side out” when “turning.” Just because it’s clear to me when I write it doesn’t mean it’s clear to anyone else! I’m so glad you ordered the soaps – they really are lovely! I love this idea but I don’t do crochet. Do you have a pattern for knitting this? Pennycents I’m afraid not. Not yet anyway! Lovely pattern Tamara! Great idea to use the cluster stitch to make it exfoliating. Thanks for sharing at Hookin On Hump Day! 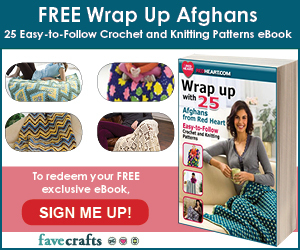 What is your policy for linking to and potentially using your patterns for selling product at a craft fair? Cayty I’m so glad you like it! 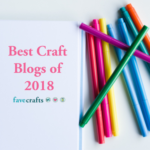 My policy is that you can use any of my *free* patterns to make finished items for craft fairs, as long as there’s a link back with “pattern courtesy of moogly” or similar wording on the tag. Good luck with the fairs! 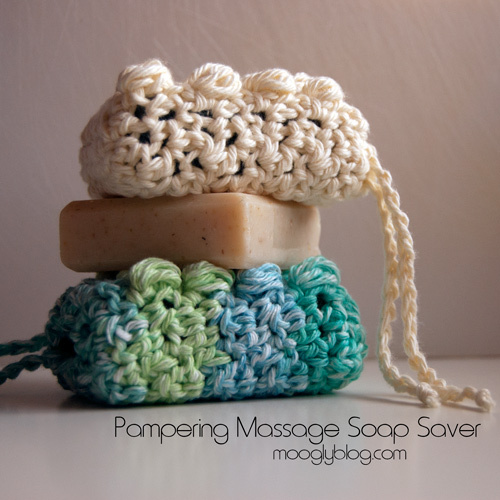 How much would you charge to make 4 Pampering Massage Soap Holders? Hi Diane! I’ll send you an email! I just made my 2nd one of these (for the 3rd time 🙂 ). When I make the cluster, it really looks much better from the wrong side. Should I be switching the WS – RS notation in the pattern? Jennifer, if you like the way it looks “wrong side out” better than “right side out,” then go with it! 😀 Everybody stitches differently, so always go with what you think looks or works best! Thank you for posting this! They turn out so cute! You’re very welcome! 😀 I’m so glad you like them! Such a cute gift! But wow, I am so confused haha. I am vertigo so lost at the “turn” and wrong side. Is it not done in a round? So, this may be an idiot question, do you turn it inside out? Ha sorry! Thanks so much for your response! You can flip it inside out if you like, or just work from the inside – whatever is easiest for you! I usually flip for the first few rows and work from the inside towards the end. Great idea Donna! Lucky mamas! This is my new favorite and the only soap saver pattern I like now 😀 I’ve tried several others and have hated how they turned out. I was easily able to tweak the pattern so I could have a mesh back on it and now I can’t wait to get my specialty homemade soaps in it to use. 😀 That’s awesome! I’m so glad! How did you do the mesh back please? This may be a silly question, but…once you bathe with the little thing, does the soap stay inside until used again? Does it dry well with the soap left in? This is adorable and I want to try it. I make crocheted washcloths, this would be nice for gifts. Thanks for any hints! Different people use them different ways, but you can certainly leave the soap in if you like! It can help it dry if you use the string to hang it up too. Hi Katy! Basically you’re “spinning” the piece you’ve made, working into the edges all around. So you work into the sides/ends of the stitches, then along the starting chain then the other end, until you’ve circled the rectangle and are working in the round. Just like putting a border on a blanket, except you’re not doing extra stitches in the corners because we don’t want it to lay flat. Does that help? This is one of those cases where I’m sure if we were in the same room for 5 minutes we’d have it sorted. Are you turning at the end of each round? 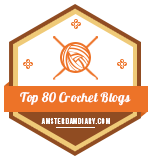 Are you making sure not to work into the slip stitch? 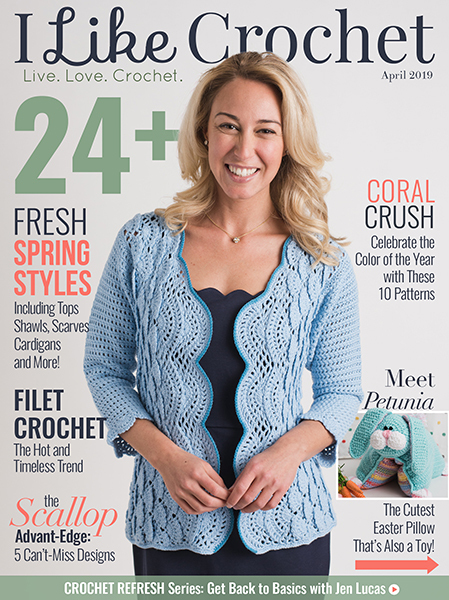 I’m too new to all this to know… I’m thinking I’ll take the pattern with me to the local yarn shop or Joann’s. I’ve tried marking the first sc. I’ve tried counting all the stitches when I finish a round…and just somehow the bumps get thrown off. I probably have too many other things going on at the same time. I think I’m hung up on the same part to – since my bobbles aren’t lining up I think this part is where the problem is. When you have the two hdc at the ends of the rows – I’m assuming these are NOT in the same stitch as the last stitch (meaning you end up with three hdc in the same loop) – but rather two separate hdc’s in the SIDES? Sorry for any confusion Rachel! Yes, the hdcs are worked into the sides of the rows – 2 on each end. I think I have the turning thing going on right..but my second row of bumps never lines up. Yep…once again…I end up with the right amount of stitches in the round…but when I get to the first CL on the second time doing round 4 (round 6) I am just past the last CL. If I remove one sc in front of it… they will line up…sigh. I love this idea and I want it to work! If you can find a work-around, go for it! It might also help to put a stitch marker in the last stitch of each round, before you slip stitch. Then you can be sure to work into that stitch in the next row. I have been putting the marker in the first sc of the round I am working on….I’ll try what you said! I’ll add it to the list Alwin! ok – got the sides – another questions – one you are finishing up round 4 – are you working the slipstitch into the chain 1 of the previous row or the 1st SC? I am making these as party favors for our August Red Hat luncheon. To keep the cost down, I’m using the mini bars of soap picked up on hotel stays to put those to good use and to show what the sacks are for. Thanks for the pattern. I think the ladies will like them. Love this item so much and want to make one for each of my sisters. I find the CL quite confusing. Not sure how to do it by the written pattern. I yo, insert hook into st – what do you mean by ‘pull up a loop to height of row? do you loop around the hook? the ‘working into same st each time’ – I just can’t wrap my little brain around it. Sorry if I am missing something. I think it would be awesome if you had a video for this! I’m fairly new at crochet and trying to teach myself. I want to do this soooo bad but I get confused just reading it. Please & thanks? haha. I hope to have one up soon! 🙂 Thank you! I’d be so grateful if you could make a video tutorial of these, they would be wonderful home-made Xmas presents! Thanks. Wonderful! Am looking forward to it 🙂 Thanks! Thank you for this pattern! I had some trouble, but kinda figured it out 🙂 My family is loving these! Thank you! Am absolutely stuck on row 4! I did the first SC and DC combinations, and not sure where the clusters are going to be, ie on the short side? Zillah this was a good day to ask – the video tutorial will go live in just about an hour! Stay tuned! I finally made one of these as a gift, along with a bar of my homemade soap. I love, love, LOVE this pattern! So easy and fast to make, and such a nice gift to give! Thank you so much for the pattern. And thank you for the video tutorial! After watching it I whipped this up in about 40 minutes. You’re the best, Tamara! Thanks again. What a fun last minute project! 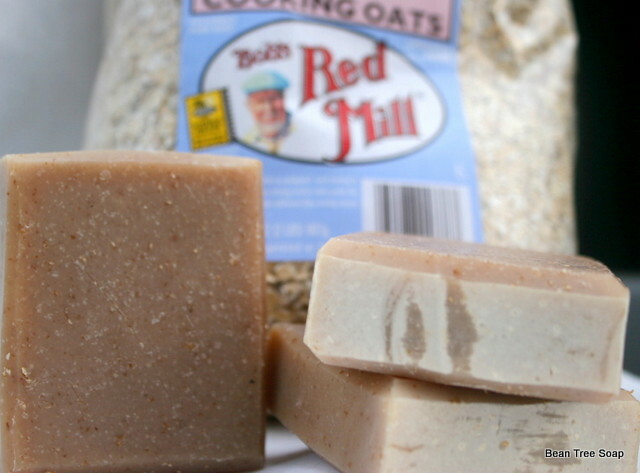 I have 3 more things to complete…but if I have time, I’ll make these and pair them with my homemade soap! 🙂 Thank you!! 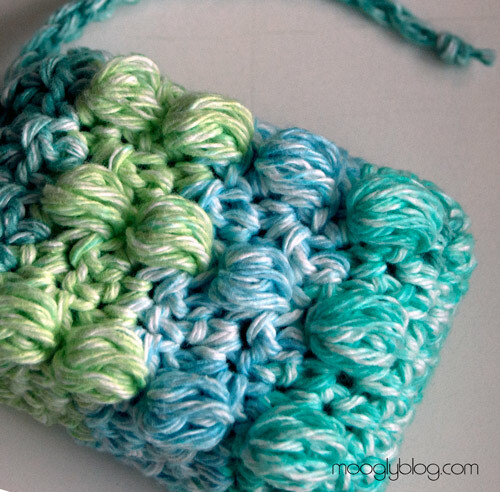 I love this quick and easy pattern for a soap scrubby! I would never have though of it myself. It took me about an hour, but your instruction videos are great as well. Thanks for sharing. I’ll be making more of these. 😀 They get faster as they go! Glad you enjoy the pattern, thank you for saying so Angie! Fabulous idea! Thank you so much for sharing the and all the other great patterns you have created. I am thinking of making these as sets along with the back scrubber… for Christmas this year. And the soap will be an added bonus. Love love love this pattern!! After ripping out rows umpteen times because my stitch count was not coming out correctly I finally “got it”. Now I’m whipping these out like nobody’s business. Thanks so much for posting this pattern. 😀 I’m glad it finally “clicked” for you! You’re very welcome, I’m happy you enjoy it! 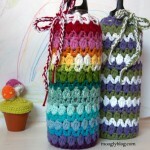 I want to make these for teacher gifts, and made a test using Bernat handicrafter (i had some already). It’s 100% cotton, and didn’t really lather very well at all. Is the yarn you recommended part acrylic or 100% cotton? Love this and am going to give it a go for some gifts. Just wondering if you have ever used an acrylic yarn (or know someone who has)? Or does it just not lather well? Thank you Reena! I haven’t tried it myself, but I believe others have tried it. A bit scrubbier depending on the yarn! Thanks! Will give it a go. Good practice in any case!! Your massage Soap saver is great. I am a Soap maker and I also do crochet. Do you mind if I translate your pattern into german and post it on a Soap Forum? (http://www.seifentreff.de) I will of course provide a link and respect your Copyright. 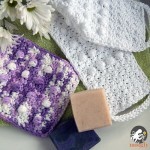 I know alot of People will be wowed by your soap saver, it is just that they cannot understand english crochet pattern. I have already done three and i will definitely do a few more.. Thank you for the pattern again! 😀 Thank you, so glad you like it! 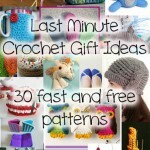 Thank you so much for your generosity with your free patterns. I see an excellent Christmas gift/stocking stuffer for me to do. Hello, here are more to give a pampering massage to some fathers! Couldn’t thank you enough for the pattern. This may be a silly question, but do you put the soap in and take it out each time you use it? I was initially thinking leaving the soap in and let dry, but wouldn’t the soap get mushy? Thank you! I’ve made a ton of these little things and I forgot how to do them each time I go to make another. I can’t always access internet to see the pattern/video. Do you have it in PDF in English? I’d like to print it out and put into my favorites file. wow how did I not see that before, so embarrassing. Thanks so much! 😀 No worries, and you’re welcome! Love this pattern! One thing though, cotton is a soap eater, not a soap saver. Acrylic works much better for soap savers. 😀 Thanks so much Deidre! Ive been at this all day and end up with two many stitches. Please Help! Round 4 Does this mean you sc dc, sc dc, sc, dc,sc,dc? OR sc, dc, sc, dc, sc? Round 4 – [CL in next st, sc in next 2 sts] 3 times. Dc in last st, and join to first sc with sl st. Do you dc in las st after crocheting 2 sc after making puff? I crochet a bit loose, dropped one hook size and the bag is the perfect size for the soap I ordered!! Love the pattern, they are going to make wonderful gifts together! Thanks for sharing the pattern. 😀 Perfect! Thank you so much Cynthia! I grazed over the comments, but couldn’t find what I needed help with. When you slip stitch into the single crochet, do you work your first stitch of the round into the same SC as the slip stitch? Made this pattern in under 2 hours. Gonna order some of the awesome bean tree soap just for my soap saver. Love this pattern. Thanks. This might be a dumb question. But, how often do you wash these! I just bought a camper and want to use this in it and want to know if I need to make several for a week long vacation. I made this and it came out pretty well. All the scrubby knobs lined up and everything. Thank you for this pattern; I will be making more as gifts. 🙂 I’m so glad to hear it Marley! Thank you! Can this be customized to different size soaps?! I sell Perfectly Posh and Inwant to make these for out Chunk bars!! Nylon !netting like a pouf? C’mon! Isn’t it a later maker and an easy dryout? I have tried to do this pattern all morning and it’s just not working out… ☹️ I love pattern/idea of the cluster stitches., etc. however I keep messing up. I’ll put it down again and try later. I’m new to crochet and I busted out five of these for Mother’s Day for all the women in my family. This pattern is so much fun and is very easy to follow. Thank you! 😀 That’s so great, thank you so much Emma, I’m so glad you liked it! I LOVE this pattern, I need to work on my guage to make the nubbies more nubbie (mine are a little too soft and keep folding back into the fabric). For extra scrubby/sudsy – use a scrubby yarn on the other side with your regular yarn, I always have trouble with soap savers and suds till I started doing scrubby yarn on a side of these bits. Great idea! I haven’t played with the actually scrubby Scrubby too much yet, but I’m looking forward to it! 😀 Thank you Elise! Do you approve the use of this pattern for the maker to sell after made? If so, what do you require to do so? Yes! You can read my policy on the About Page: https://www.mooglyblog.com/about-moogly/ 😀 Best of luck with your sales! Hi Tamara, thanks for the adorable pattern! I’m working on this, and it is coming out beautifully… But when I finish the 3rd repeat (so I have 12 bumps plus the next row of flat crocheting) I realized that while *perhaps* wide enough, my sack is not nearly tall enough for a bar of soap. I end up needing 2-3 extra rounds of bumps and flat rows. What should I do? I really want it to come out the right size with only the correct number of rounds, per the pattern. I’m thinking, increase my hook size and/or adjust my thread tension…??? Hi Melissa! You can just add more rows to make it taller! 🙂 That will let it stretch a bit wider too. Love the pattern but I have issues when working in the round. Can this be converted to rows and how? I do recommend trying it in the round though – there’s a video tutorial linked above that walks you through this pattern! Thank you! Will try and I’ll let you know how it turns out. I will take a look at the video tutorial also.